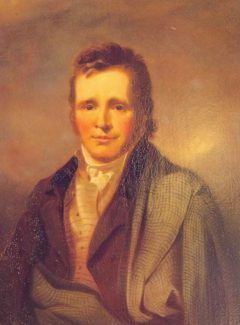 In this article Bruce Gilkison, great-great-grandson of the Ettrick Shepherd, explains why he was driven to trace James Hogg’s walks in Scotland and reveals how he was ‘smitten’ by the same landscapes walked by Hogg hundreds of years earlier. In 1802, James Hogg set out on the first of a series of remarkable journeys through Scotland. The most remarkable of all, though, would start long after his death. He was born in the Scottish Borders in 1770. He grew up in poverty, and was sent out to work on farms and as a shepherd from the age of six. In his late teens he heard a poem by Robert Burns and decided that he, too, should become a great poet. Then he cried, because he remembered he couldn’t read or write. But he never let little things deter him. His journeys through the Highlands and Hebrides were a turning point. They inspired and frightened and educated him. He would return to the Borders and Edinburgh, to a life of chaos and writing and failures and fun. And in time, he would write highly-acclaimed poetry and prose, including a novel which some now believe is one of the greatest books ever written. In his lifetime he was never fully forgiven by other writers for his lack of education (just six months at school) and the subjects he wrote about – real things like poverty and prostitution, which were uncomfortable for many and were discouraged. His writing lacked ‘gentility’. Wordsworth said he was a man of genius, but had ‘coarse manners’ and ‘offensive opinions’. Was he a genius? Maybe. Some of his works were ground-breaking. But sometimes his work came to him from heaven – shepherds had a direct link – and he wasn’t always sure which bits to change or reject. Other aspects of his life were just as ambiguous. It was full of quirkiness and love and sport and music. Of wonderful friendships and spectacular fallings-out. He was frequently penniless, always generous. He had a unique ability, whenever things seemed to be going well, to somehow make sure that they didn’t. Biographer Karl Miller called him ‘the unlikely man who helped give the word “personality” its modern meaning’. I set out walking through Scotland to find out what was special about his journeys. They’d been life-changing for him, and would be for me. But there’s a later journey too, which began with a strange rediscovery. After he died, his works had been revised and republished: sanitised, over some decades, and made ‘genteel’ for a Victorian audience. They lost their edge as a result, and their readership too, and were nearly forgotten. Then, a hundred years after his death, French Nobel Prize winner André Gide read Confessions of a Justified Sinner in its original form and was ‘voluptuously tormented’ by it. It was the start of a resurrection that would have stunned even Hogg. In the 21st century, readers, writers and researchers are finding new value in his works. His kind of bluntness has become acceptable. His vivacious female protagonists, created in times when women in literature were inclined to be passive, are still fresh and attractive to modern readers – probably a legacy from his anything-but-passive mother. Crime-writer Ian Rankin said Hogg’s views on religious extremism are relevant and urgent today. Sir Sean Connery said Justified Sinner is a masterpiece. Trainspotting author Irvine Welsh called it one of the most brilliant books ever written. 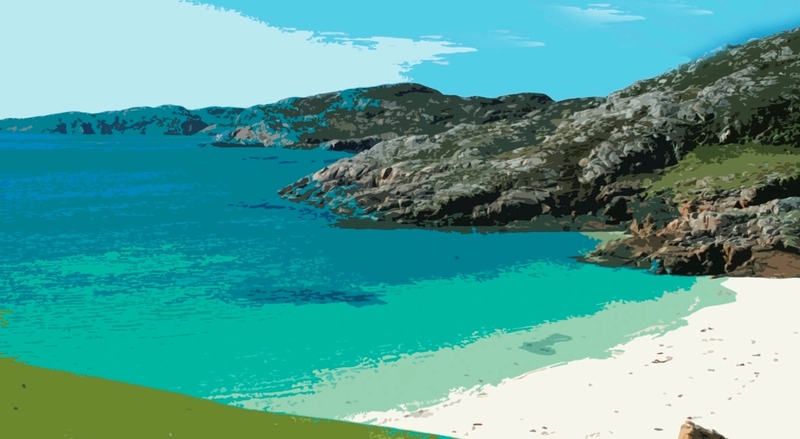 It ranked third in a recent survey to find the Greatest Scottish Novel. Nobel Prize winner Alice Munro is a direct descendant of Hogg’s eccentric grandfather (the last person in the Borders to talk with fairies). Modern researchers have found intriguing parallels between Hogg’s writing and hers. Their stories raise difficult questions and refuse to give easy answers. For me, these journeys were a time of strange new connections. Hogg was known as the Ettrick Shepherd, reflecting his rural roots, and he had a love for the hills. He said he got a headache if the land around him was too flat. Mountains are in my blood too, but I had no idea where this came from. And I love to write too, but until now I didn’t know why. I’d assumed the life of a struggling writer and shepherd in the early 19th century would be an endless grind; he showed how much fun they had. I became fascinated by ancestors, not just my own. And my bond with Scotland, which I’d visited only briefly before, turned out to be more profound than I’d ever imagined. Hogg’s travel journals spoke of magic and mystery; of fairies, witches, ghosts and monsters. These were oddly familiar to me – similar beings are alive and well in other places I’ve lived, in Africa, the Pacific and even, quite recently, in New Zealand. I met with descendants of people he knew – of dukes and writers, and of a famous girlfriend (we had to work out what really went on, or didn’t, between them). I searched for descendants of his illegitimate daughters. I visited houses and castles and pubs he’d stayed in. I slept in a house his grandparents lived in – a century older than the oldest surviving building in New Zealand. In a day of walking in the Highlands I found three inns he’d visited, all still open for business. I was smitten by the same landscapes. The journeys were not always comfortable, but this was usually self-inflicted. 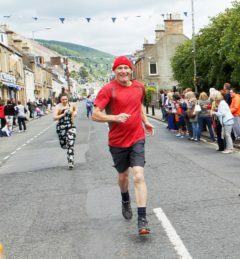 I raced with him through the mountains one day – could I match the pace of a shepherd a couple of centuries earlier? And I went through areas of wilderness just as wild now as then, though the masses of eternal snow and ice he saw have gone. 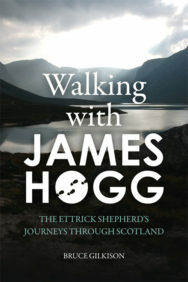 Novelist James Robertson said he thought Hogg and I would have been great walking companions ‘but not without a falling out or two along the way’. It’s true – our flaws would clash. I came to know him and love him but never to understand him completely. If I tried to predict what he would do next I usually got it wrong. If time and opportunity allow, please try some of these journeys on foot. Frédéric Gros said walking is the best way to go more slowly than any other method. To really know Scotland, there’s no better way. 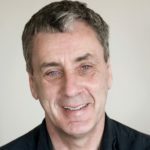 Bruce Gilkison is a New Zealander, and a great-great-grandson of Scottish writer James Hogg. He is a keen climber and traveller who has lived and worked in the Pacific, Africa, North America and Europe. He has a passion for social and environmental issues, and a love for the wild and wonderful. He walked through Scotland to find out what was remarkable about Hogg and his journeys. He learned about his eccentric ancestor’s bumpy road through life, and his lively posthumous journey in the 21st century. Walking With James Hogg: The Ettrick Shepherd’s Journeys Through Scotland by Bruce Gilkison is out now published by Edinburgh University Press (PB, £14.99). 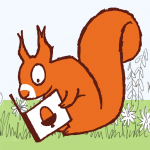 Gilkison will be speaking about Walking with James Hogg at the 2016 Edinburgh International Book Festival on 22nd August: details of this event,’In the footsteps of James Hogg’, are here.